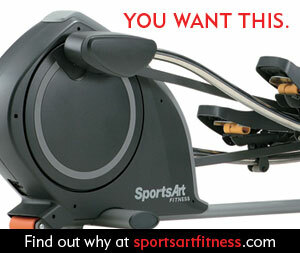 Almost all elliptical trainers offer both forward and back motion (also called dual action motion). This allows you to work different sets of muscle groups in your legs (hamstrings vs quads) which adds up to more calories burned, more muscles toned and an overall better body workout. A properly designed elliptical trainer mimics your body’s natural stride – the way your foot moves elliptically when walking, running, or jogging. You stand upright striding in a forward or reverse motion. Your feet never leave the pedals. Because of the lower impact of an elliptical workout, the elliptical machine is becoming very popular with the older population or those who are more easily prone to sports injury. Many elliptical trainers offer moveable upper body arm bars. By working both legs and arms, your heart rate elevates more quickly which encourages your body to burn calories faster and more efficiently. It also results in a lower perceived rate of exertion (basically you don’t feel like you worked as hard as you really did). This may mean that you end up burning more calories, even without feeling like you did much of a workout. By offering upper body arms, an elliptical trainer workout also helps you tone your arms, shoulders and back for better definition. An elliptical trainer workout has many advantages over other exercise machines. It gives you an overall body workout that burns extra calories and gives you an extra efficient workout. Just make sure you choose one that meets your needs and is properly designed for maximum comfort.